These silver earrings are inspired by the ornate jewelry work of the past century. The earrings almost appear to be made up of an entirely original creation, when in fact they are made solely from a monogram of three letters. The Sterling Silver Monogram Earrings create a highly artistic pattern that turns ordinary letters into works of art. These silver earrings have a lovely quality that is both alluring and revealing at the same time. The monogram earrings feature a unique, sterling silver design that measures approximately 18mm by 15mm. In this piece, three letters are positioned together in a rectangular shape to read as a personal monogram. The letters are decorated with beautiful curves and details that take the earrings to a whole new level of sophistication. The letters form a solid piece of silver with a hoop at the top to connect to a silver ball stud and push-back post. The earrings dangle elegantly from the ear with an easy, comfortable fit. Silver monogram earrings such as these are a true delight because of their originality. 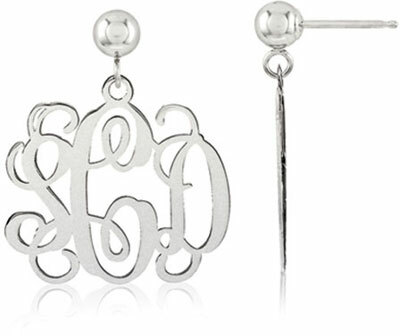 Once you choose the three letters for the monogram, the earrings are designed just for you. You will certainly enjoy the unique design and be tempted to wear the earrings on so many different occasions. We guarantee our Sterling Silver Monogram Earrings to be high quality, authentic jewelry, as described above.